Growing a mini-kidney from human skin cells is a wonderful achievement, but the laboratory version is not a fully grown and functioning kidney. Researchers from Leiden and Australia transplanted such a mini-kidney under the kidney capsule of a mouse and saw that it grew into a more mature mini-organ, inclusive of blood vessels. They published their results in Stem Cell Reports. “The mini-kidney we can grow in a laboratory does have all the different cell types and parts which can be found in a ‘real’ kidney, but so far we haven’t been able to manage to properly attach the blood vessel system in a culture dish and achieve sufficient maturation of this kidney tissue”, explains LUMC researcher Cathelijne van den Berg. That system is essential for the kidney, the main function of which is to filter the blood. The researchers transplanted their mini-kidney under the protective layer surrounding the kidney of a living mouse. They were very pleased to see that in four weeks’ time the mini-kidney showed evidence of fully developed adult kidney tissue. “We saw that the blood vessels of the mini-kidney connected to the blood vessels of the test animal’s kidney and that blood was actually flowing through the filtration systems of the mini-kidney. Also, as regards composition and structure of the various parts, the mini-kidney looks a lot like a fully-grown organ”, according to Van den Berg. To compare, the researchers let another mini-kidney grow further in the culture dish, but it did not develop similarly. On the contrary, this mini-kidney deteriorated. The findings are the result of long-term cooperation between the LUMC and the the Murdoch Children’s Research Institute on regenerative medicine in the European research consortium STELLAR, in which stem cell techniques are developed as an alternative for renal replacement. In 2015 Prof. Little worked at the LUMC for a few months as Boerhaave Visiting Professor. 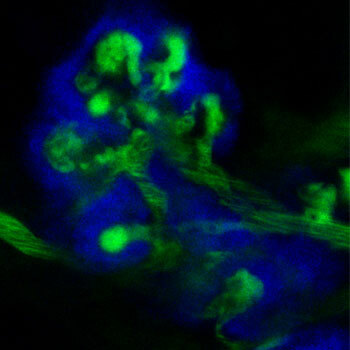 Photo: Blood (green) flowing through the filtration units (blue) of the mini-kidney. Read the full publication 'Renal subcapsular transplantation of PSC-derived kidney organoids induces neo-vasculogenesis and significant glomerular and tubular maturation in vivo' on the Stem Cell Reports website.